Lewis Hamilton leading Sebastian Vettel at the Bahrain Grand Prix. 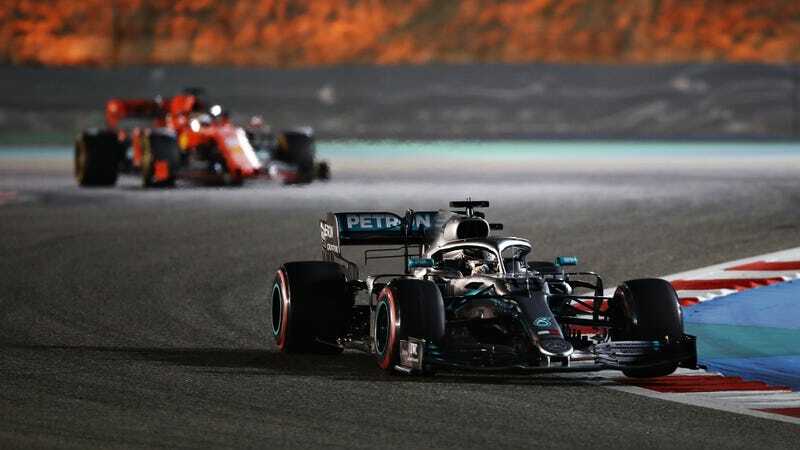 When it comes to the racing, there are a lot of things one could say Formula One needs—more vehicles capable of winning a race without everyone else breaking down or vanishing into thin air, less predictability, closer racing, and, of course, more passing. The good news is, the folks at F1 think that last one may improve this year. They’re not talking small improvements, either. Motorsport.com reports that F1 thinks overtaking numbers could increase by 50 percent in some races, based on simulations its technical folks have run on the new aerodynamics regulations. The lack of overtaking in F1 has been a big deal in recent years, especially the dismal 2017 season, when the average number of overtakes per race was half of what it was the year before. But F1 introduced regulations for simplified aero for this year in hopes of changing that, in addition to its existing Drag Reduction System to help overtaking, and simulations show that it may just work. “Some simulations were showing a +10% increase of overtaking, assuming a similar evolution of a race, of course. “In other races the same simulations expect a more sizeable increase, possibly to the tune of +50%. There don’t appear to be comprehensive overtaking numbers for the 2018 F1 season online, but the 2017 season was when things really didn’t look great. Pirelli announced that there had been 435 overtakes that year, or an average of 21.8 overtakes per race. Combined with Autosport data from 2001 through 2016, the numbers from 2017 were the worst they’d been since the introduction of DRS in 2011. But two years later, aero regulations have undergone a slight overhaul to try to trend those numbers back upward. Overtaking numbers in Formula One, with the red section marking the years since the series introduced its DRS system to help passing. The 2019 aero regulations in F1 include simpler front and rear wings as well as a simpler design on the front brake ducts, meant to make the racing less spread out. The series is two races into a 21-race season—the opening Australian Grand Prix, which isn’t an easy track to overtake on regardless of aerodynamics, and the Bahrain Grand Prix, which was fun to watch for more than just the passing and extra DRS zone. Given that we haven’t seen much racing yet, it’s hard to gauge how much of an impact the new rules have had. But there are 19 races to go this year, meaning we have a lot of time to see—and hopefully enjoy—just how much of an impact these rules may have.